Our boys program is structured to accommodate beginners, intermediate and advanced players in grades 2 through 12. Below is an overview of our programs by season and skill level. 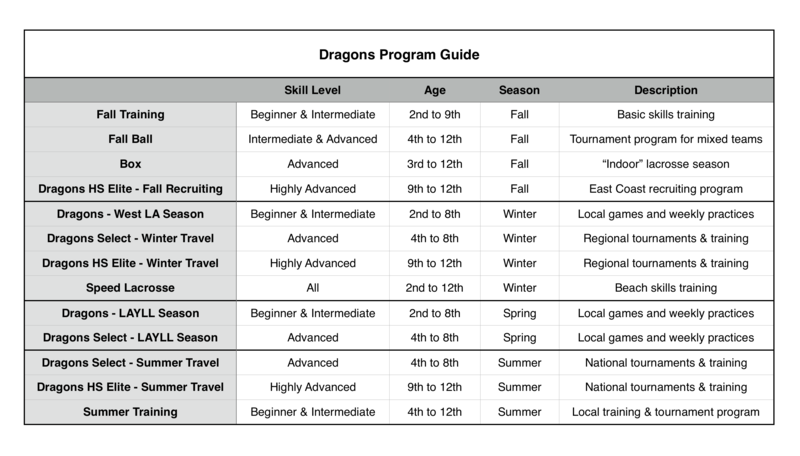 DRAGONS SELECT: This is the advanced level of our youth program and covers 4th to 8th grades. Teams are formed via tryouts and compete regionally in the Winter and Spring at very tough tournaments. Select practices twice a week in season and each team has 2 coaches. Select is a significantly higher commitment than Dragons. DRAGONS HS ELITE: This is the most advanced level of our program and is specifically geared towards high school players. HS Elite competes at the toughest tournaments in the highest divisions and is supported by a comprehensive recruiting program. Training is a very important part of our high school experience so we typically offer 2 practices a week in season. HS Elite runs in the Fall (recruiting), Winter and Summer. Our HS Elite teams are invite-only.